If the idea of human beings living inside large underground cave structures seems too “post-apocalyptic,” then you will definitely be surprised to know that not only have humans from the distant past built such structures but may have lived in them for many hundreds of years! In 1963, a simple home renovation in the district of Derinkuyu in Turkey led to the discovery of a magnificent multi-level underground city that lay hidden for centuries. Scientists and archaeologists estimate that it may have been built between the 8th and 4th centuries BCE. The 280-foot-deep underground city, which comprises 13 stories, is vast enough to have once been capable of accommodating at least 20,000 people and various livestock. The structure contains numerous stables, wine and oil presses, churches, and storage rooms. It also contains more than 15,000 cleverly designed ventilation shafts that enable air circulation throughout the underground city. Water was sourced through underground rivers and wells, designed in such a way that contamination from surface resources was not possible, for example, in an event when an enemy attempts to poison the city dwellers. The intricate passageways connect the various family rooms to places where people would have gotten together to worship, work, or socialize. There are also craftily designed stone doors located at strategic entry points that were used to seal off the rooms in case of any external attacks. Theories regarding how, when, and why the city was built range from the pragmatic to the rather outlandish. According to the Turkish Department of Culture, it was the Phrygians who started building the structures in the 8th to 4th centuries BCE. It is believed to have taken its present form around the Byzantine Era between 780–1180 AD and was used as a hideout by many people during the Arab invasion, and later against the invasion of the Mongolians. 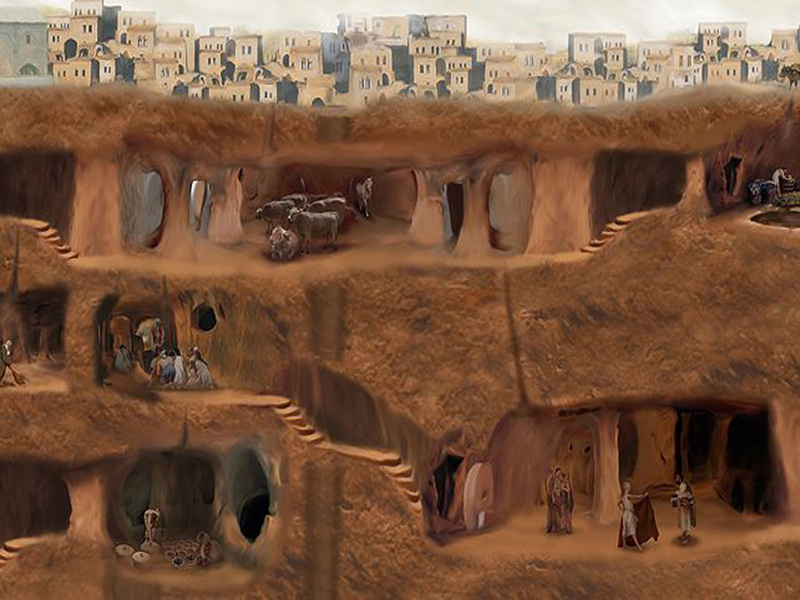 Derinkuyu: an underground city. The meaning of the name is ‘deep well’. Narrow walkway in Derinkuyu Underground city. A more unorthodox theory suggests that the city was built somewhere between 10,000 and 18,000 years ago and used as a shelter during the global ice age. The theory is based on the literal interpretation of the Zoroastrian text “Vendidad,” which narrates the story of the prophet Yima, who built an underground city at the instruction of the god Ahura Mazda, in order to protect his people from the bitter cold. Since its rediscovery, it has become a popular tourist destination. About half the structure is currently accessible to visitors. And although other such underground cities have been discovered throughout the region, the Derinkuyu still remains the most popular one, thanks to its uniqueness of being the deepest such structure in Cappadocia, Turkey.